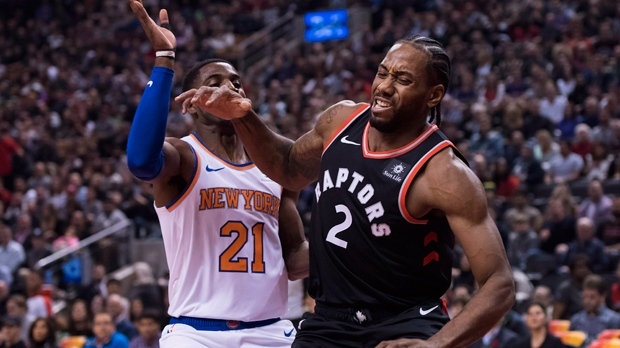 TORONTO -- Pascal Siakam scored 23 points, including three three-pointers, and the Toronto Raptors remain undefeated at home after a 128-112 victory over the New York Knicks on Saturday. Jonas Valanciunas had 19 points, while OG Anunoby contributed 16 for the Raptors, who boast the NBA's best record at 12-1. Kawhi Leonard had just 12 points on 2-for-7 shooting - just the second game he's scored less than 20 points as a Raptor. Six Raptors scored in double figures with Delon Wright scoring 12 and Kyle Lowry chipping in with 10. Tim Hardaway Jr. had 17 points to top the Knicks (4-9). The game was the Raptors' first at home after going a perfect 4-0 out west, and perhaps it was a combination of the afternoon start time and being back on eastern time, but the Raptors looked nothing like the league's best team in the early going. And Leonard's first field goal didn't come until 46 seconds left in the first half. But the Raptors went into the fourth quarter up 100-82 and seemingly with the game well in hand, and when Anunoby drained a three-pointer with eight minutes to play it put the Toronto up by 20 points. By the time Valanciunas connected on a three with 1:33 to play, a few hundred of the 19,800 fans at Scotiabank Arena had already left. Danny Green's three long bombs on the night gave him 1,000 made three-pointers for his career. Lowry was the last Raptor to accomplish this feat in December of 2016. The game tipped off a couple of hours after news broke that Minnesota had traded Jimmy Butler to Philadelphia, potentially turning the 76ers into a team that could make some serious noise in the Eastern Conference. “It certainly brings a really good player into our gym a few more times, so we look forward to that,” Raptors coach Nick Nurse said of the deal. The Raptors had four turnovers in the first five-and-a-half minutes, and it was more than four minutes before they got their field goal - a Green three. Still, the Raptors managed to keep it close, and Wright's putback with two seconds left sent the game into the second quarter tied at 25-25. Anunoby led the way with nine points in the second, and an 11-2 run by Toronto's bench gave the Raptors a seven-point lead. A pair of Leonard free throws put Toronto up 64-53 at halftime. Siakam had 14 points in Toronto's decisive third quarter. The Raptors host the New Orleans Pelicans on Monday, and then Dwane Casey returns to Toronto on Wednesday with his Detroit Pistons.